This textbook is suitable for the following courses: Foundations of Leadership, Introduction to Supervision, Introduction to Management, Professional Development, Character Development, Introduction to Leadership, Educational leadership, Business Leadership, and Industrial Psychology. 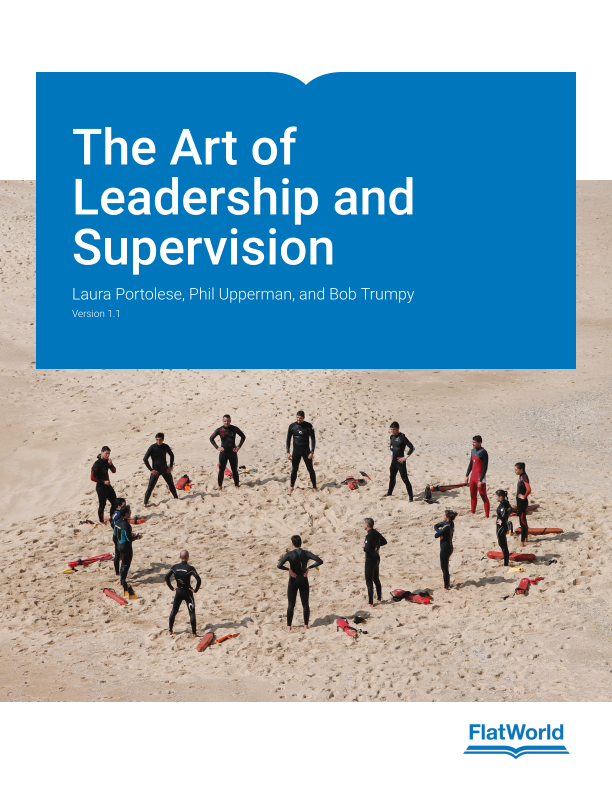 The Art of Leadership and Supervision is a comprehensive text, covering both leadership and supervision. The authors aim to prepare students for a future career in management by not only discussing leadership from an academic perspective, but also demonstrating how to apply those leadership characteristics and theories to the actual management and supervision of people. In addition, the authors believe that in order to be good leaders, people must understand themselves; therefore, the book focuses on self-assessments. New and updated examples throughout the text. Updated leadership and supervision research implemented and discussed within the text. New and updated video content added throughout the text. Content revised throughout to aid in student comprehension. Chapter openers contain realistic examples to introduce each concept. YouTube videos, learning objectives, and key takeaways. Conversational tone and experiential practices. 2.1 Getting Defensive To Prove Your Superiority Or To Expose Your Insecurity? 9.1 Unethical Or The “Way We Do Business”? Dr. Phil Upperman, EdD, has more than thirty-five years of experience as leader, staff officer, lecturer, trainer, and instructor at mid-management and leadership development schools and universities. Phil is currently serving as a lecturer and adviser at Central Washington University. He has held a department chair position as the professor of military science at Seattle University. In this position he was the program director responsible for developing undergraduate students in the areas of leadership character, individual and team development, and organizational and operations management. As an instructor at the United States Army Infantry School he taught leadership, tactical and operational art and science, organizational management, and physical fitness development. At the United States Military Academy (West Point) he served as a University level psychology counselor responsible for personal leadership development of cadets as individuals and in groups. Phil has twenty-eight years of service, commanding at the company and field grade levels as a platoon leader, two company commands, and as a battalion commander. Phil has served on General Officer staffs as an Aide-de-Camp of a Corps Logistics Command, Chief of Operations at the Division and Battalion levels in the 101st Airborne Division, and as a Deputy Chief of Operations on the I Corps staff. At West Point he held the position of Deputy Garrison Commander (Deputy City Manager). He has also held several Executive Officer staff positions at the Brigade and Company levels. In the private industry sector he held positions as a program, region, and national director for a technology education company serving government and private education programs. Phil has a proven experiential track record of long-term success and achievement in the areas of fiscal management, human resources, operations, marketing, organizational training, and operational and leadership program development. Phil holds a doctorate from the School of Education at Seattle University, a masters degree in education and counseling psychology from Washington State University, and a masters degree in business management science from Troy University. As an Army officer, he graduated from the Army's Command and General Staff College, Officer Advanced (Mid-career) and Officer Basic (Entry-level) leadership courses, with a professional education focus on tactical and operational art and science, and organizational leadership and management. Dr. Bob Trumpy is currently an associate professor of administrative management in the Department of Information Technology and Administrative Management (ITAM) at Central Washington University. From 1998 to 2009, Bob had been an administrator in the Division of Student Affairs and Enrollment Management (Senior Director of Health and Counseling Services), having also served in the role as lecturer in the College of Education and Professional Studies for the Department of Teacher Education and the Department of Information Technology and Administrative Management. Bob holds a doctorate of education (educational leadership–higher education administration) from Seattle University. His experience includes more than twenty-three years in leadership and supervisory positions in the fields of health care, consultation and training, and higher education. Bob is certified to administer and interpret the Strong Interest Inventory as well as the Myers-Briggs Type Indicator and is a State of Washington licensed mental health counselor and a State of Wisconsin licensed clinical social worker.